Need a unique/different kind of gift for a Ring Bearer? 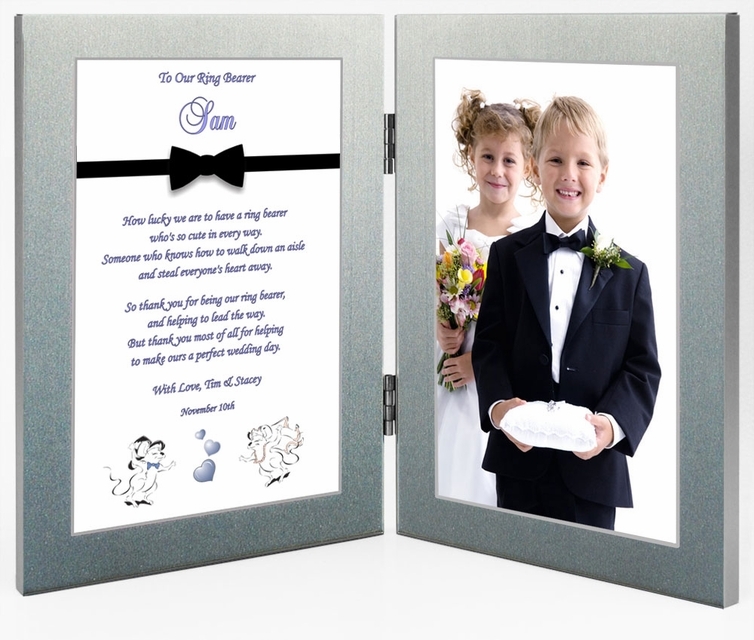 Take a look at this personalized Ring Bearer photo/picture frame. A perfect "Thank you for being our ring bearer" gift. The original poem is personalized with names, date, and a personal message. Presented in double attached photo frames. Add a picture of the young boy in the cut-out photo area and now you have a unique gift for your ring bearer. Say thanks to your ring bearer for safeguarding the rings and leading the way. An adorable design and memorable poem - How cute is that? This original Ring Bearer Thank You poem is personalized with names, date, and a personal message. Presented in attractive attached double silver metallic photo picture frames. Add a picture of the young boy in the 4x6 inch right frame to complete this customized attendant's present. After the wedding a photo of him at the wedding can be added to the frame. We put a picture of our ring bearer in this frame and gave it to him. He laughed so hard when he saw his picture next to the dogs.